Want to try some of the best burgers on Maui? 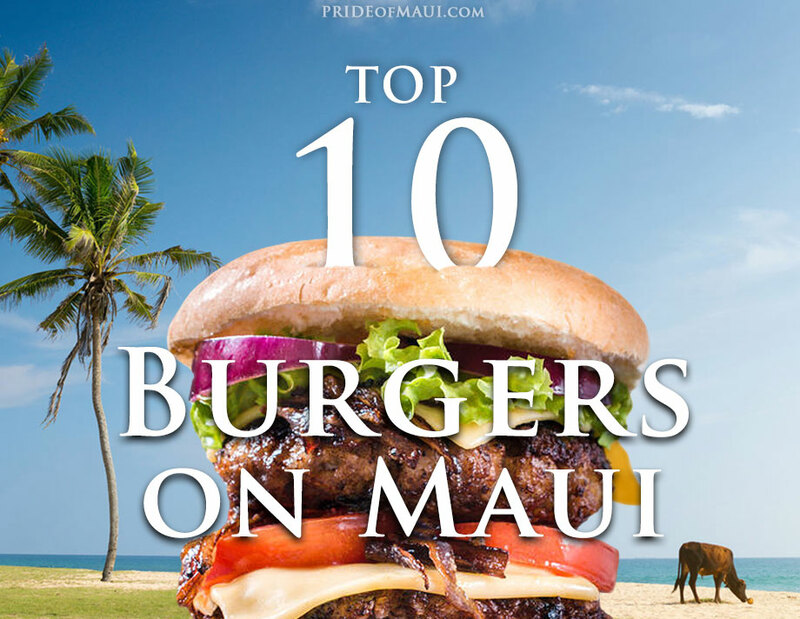 Get ready to experience a mouth watering adventure while reading our Top 10 Places to eat a Burger on Maui. Without question, the Valley Isle offers an array of incredible activities to explore; Hawaii ocean activities, historical and cultural events, live music, shopping, and an ocean of amazing Maui restaurants. Besides fine dining, local food, and a happening foodie scene, our island also offers up a meaty selection of fantastic Maui burger spots. Although we haven’t listed them all, we think this is a pretty good start! Enjoy this article, and share it with your friends…A hui hou! Hands down, our newest favorite place to enjoy a juicy and delectable burger on Maui is The Pint & Cork. Located in the Shops at Wailea, here’s your next go-to locale in West Maui for the burger lovers. The Pint & Cork is one of Maui’s newest editions to the brewhouse, gastronomy and Maui sports bar scene. The restaurant/bar is family-friendly, a great place to meet up with friends and an even better spot for socializing and making new friends in the dating scene. The burger at Pint & Cork is amazing! Named the BIB Burger, carnivores can enjoy a savory house ground beef patty with white cheddar, crispy bacon, charred onion, fried egg, pickle, arugula greens, whiskey 1000 and an ‘oh, so satisfying’ brioche bun. This is the only burger on their menu, and it’s absolutely the only one that they need. Upgrade it with an order of their Parmesan Fries and you’ll be in 7th Heaven. If you’re visiting this Maui restaurant with kids, not to worry, they also have Keiki Sliders on the kid’s menu; two mini cheeseburgers served with French fries. Make it a family burger affair. When you order a burger at Pint & Cork, compliment it with a selection of their famous side dishes like their Mac & Cheese and Fried Chicken Wings. You can’t go wrong. Here, you’ll find quite the beer selection, so you’ll also want to add a few of Maui’s microbrews to your order. The Pint & Cork is open from 11am-2am 7 days a week. Their kitchen closes at midnight, but you can still enjoy cold brews, mixology-style cocktails and good times until their doors close. Rated “Best Burger on Maui” by numerous publications for 10 years in a row, Cool Cat Cafe in Lahaina is the “it” spot for a succulent burger. All of their burgers are made fresh daily and are 100% Certified Angus Beef. Seasoned with their signature seasonings, you can’t go wrong with a Cool Cat burger and a side of onion rings! A BIG handful of the most popular burgers at Cool Cat are the “Leader of the Pack,” “Big Bopper,” “Bonanza,” “Ali’i,” “Bogy Burger,” “Marilyn Burger” (some like it hot! ), “The Duke,” “Jailhouse Rock,” “La Bamba Burger,” “The Frisco” (served on grilled sourdough), and my personal favorite “The Luna Burger” (served with bacon, melted Jack cheese, avocado, lettuce, tomato, mayo, mustard, onions, pickles and a homemade Thousand Island dressing). Another cool thing about Cool Cat’s Burgers is that they always have a ‘Burger of the Month,’ so it’s impossible to get bored here. The January 2019 Burger of the Month was the “The Dip” (Angus beef topped with Swiss cheese, smothered with mushrooms and onions sauteed in a garlic black pepper cream sauce and served on a fresh-baked ciabatta bun with sides of au jus and their homemade horseradish cream). Holy moly! For more information, please visit Cool Cat Cafe. Located Upcountry in Ulupalakua, residents and visitors should definitely take the worthwhile trip up for some juicy Maui meat! This is a great place to grab lunch if you’re exploring Upcountry activities, farms or the Maui winery. The historical Ulupalakua Ranch Store has an amazing grill, and it just keeps getting better! At this Maui burger spot guests can choose from Maui Cattle Beef Burgers, Maui Venison Burgers, Maui Bison Burgers, or Executive Chef Will Munder’s personal favorite, the Lamb Burger (a juicy local Lamb meat patty with melted Swiss cheese, Waipoli lettuce, sweet Kula onions, and ripe Maui tomato slices). Umm…yum! For more information, please visit Ulupalakua Ranch Store. Located on Front Street in Lahaina, everyone should visit Mala Ocean Tavern for a full menu of delicious food. For all intents and purposes of this article, don’t forget to order the Cheeseburger! Served on a house made flax and chia seed bun, Mala’s amazing “Durham Ranch American Kobe Beef Cheeseburger” is like heaven in your mouth. First of all, Mala knows how to cook a burger, so it’s not going to be served under or overcooked. This delightful Maui burger is served with applewood smoked bacon, caramelized Maui onions, romaine lettuce and tomato, and a choice of either cheddar or Maytag blue cheese. To take it over the top, this Mala masterpiece is also served with pomme frites (traditional French fries). C’est Magnifique! Besides the awesome Mala Cheeseburger, they also have a flavorful Maui Taro Burger and house-made Ahi Burger. 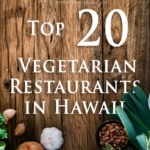 The Maui Taro Burger is made with 100% Maui grown Taro, spiced to perfection and served with veggies only (this is a fabulous Vegetarian burger). The house-made Ahi Burger at Mala is made with fresh ground local Ahi tuna, spices, romaine lettuce, tomato, and house made tartar sauce. It’s all good here! The “Maui Cattle Company Cheese Burger” is made with 100% Maui grown beef, Dijon aioli, Fontina cheese, vine-ripened tomatoes, butter leaf lettuce, and a house made quick pickle. “Pete’s Classic Burger” definitely won’t disappoint, made with 100% Maui grown beef, Umami mushrooms, Gruyere cheese, arugula greens, and horseradish crema. If red meat doesn’t tickle your tongue, guests can also enjoy Monkeypod’s fantastic “Turkey Burger.” This guy is made with 100% free range natural turkey meat, Asian pear slices, sautéed onions, Gruyere cheese, arugula greens and house cut bacon. Mmm…mmm…mm! For more information, please visit Monkeypod. Located in Paia, Maui’s sweet little small town on the North Shore, all restaurant lovers should take the time to seek out the burger flavors at Cafe Mambo. At this family-owned Paia eatery, guests can enjoy international flavors fused into everything on the menu. All of Mambo’s melt-in-your-mouth burgers are priced between $12-$14. This is a great place to eat in Paia with your family and friends, and definitely a place for a tasty meal without breaking the bank! For more information, please visit Cafe Mambo. Not only can you visit Maui Brewing Company’s Kihei tasting room, but you can also stay for a while longer and enjoy one of the best burgers on Maui at their newest Maui restaurant. What makes this Maui burger so special? Everything. In fact, there are three amazing burgers on this Maui brew house menu; the MBC Griddle Cheeseburger, the Jalapeño Bacon Burger and the Against the Grain Veggie Burger. We love every single one of these tasty burger versions, and alongside a cold Maui brew, house cut or siracha fries, you are golden. The MBC Griddle Cheese Burger is super savory with shaved red onion, butter lettuce, cheddar cheese and MBC’s special “8 Island Sauce.” The Jalapeño Bacon Burger is definitely for someone that likes a kick of flavor with a house made jalapeño bacon, jack cheese, fried avocado, and tasty cilantro mayonnaise. The Against the Grain Veggie Burger is a top choice, and definitely not like your conventional veggie burger. It’s made with fresh vegetables and macadamia nuts and is highlighted with miso, pickled ginger, avocado, and mayo. They are all so ono. When visiting this restaurant, seek out more information about their daily specials because, from time-to-time, they also have burger specials! For more information please visit Maui Brewing Company’s Kihei location. Teddy’s Bigger Burgers in Lahaina is where you’ll find one of the juiciest and tastiest burgers in all of Hawaii! They only have one brick-in-mortar location on the Island of Maui, so if you’re cruising the West Side, make sure to check them out. The decor is reminiscent of a 1950s diner; they even have ice cream floats and delicious milkshakes to get you cozy to that idea. At Teddy’s, the menu is simple, yet streamlined and full of yummy goodness. The first thing you have to decide is what size burger you want: Big (5 oz. ), Bigger (7 oz.) or Biggest (9 oz.). For the beef burgers, you have a choice of Original, Teriyaki or a Monster Double. Each burger is made to order, so you know it’s going to be perfectly cooked to your liking with many options for extras. You can add cheese (of course! ), grilled onions, onion rings (yum! ), grilled pineapple, jalapeños, bacon, mushrooms, avocado (yes! ), fried egg, green chile and more. If you’d prefer a grilled or crispy chicken sandwich, that’s a possibility too. They also offer a yummy turkey and veggie burger for those that aren’t inclined to beef. The kid’s menu is perfect with a burger, corn dog or chicken nuggets option- and the kid’s combo comes with fries and a drink. Ok, the extra crispy french fries at Teddy’s in Lahaina are off-the-hook! They also have tater tots and onion rings, and you can even order the fries spicy, with garlic or with cheese. Teddy’s Burgers also has a food truck that travels around the Island of Maui, and a burger trailer behind Kihei’s Azeka Marketplace. To learn more, check their Facebook page here. If you happen to find yourself venturing through Haiku and wondering where to go for a burger, no worries brah! All you have to do is get yourself to Colleen’s at the Haiku Marketplace. When you find this Haiku gem, you will not only be happy that you did, but you will soon realize that you are about to eat one of the best burgers on Maui. Colleen’s doesn’t have just one, but eight amazing burgers! The “Upcountry Beef Burger” is made with Maui Cattle Company hormone-free beef, locally grown Maui tomatoes, thinly sliced onions, crisp lettuce, and melted Muenster cheese. Another great Maui beef option is the “Bacon & Blue Cheese Burger.” Both the “Portobello Mushroom Burger” and the “Organic Life Burger” are Vegetarian selections, and all the fish burgers are a good choice with the “Grilled Ono Fish Burger,” “Grilled Ahi Burger,” “Grilled Mahi Mahi Burger,” and the “Fresh Catch Burger.” When ordering burgers at Colleen’s in Haiku, you can add fries for $1 and a pint of beer for only $3.95. That’s a great deal! For more information, please visit Colleen’s at the Cannery. Enjoy all the best that Maui’s North Shore beaches offer, and take a break from the sun to hit up Milagros Food Company in Paia Town. Milagros is an awesome locally owned Maui restaurant located on the corner of Hana Highway and Baldwin Avenue, a perfect spot for people watching from a patio table! By the way, if you haven’t guessed by now, Milagros also happens to have some fantastic burgers. When at Milagros, know that local organically (GMO-Free) grown ingredients are used wherever possible. Here, you’ll find a handful of super duper Fire-grilled Maui burgers with all the fixings. Here, guests can choose from either a 1/2lb hand pressed beef burger, or an 8oz. chicken breast. All the Milagros burgers are served with a side of lettuce, tomato, onion, pickles and crispy (yummy) French fries. Guests can also easily substitute fries for a salad or rice and beans* The “Classic American” burger is topped with melted American cheese, and the “Bacon Cheddar” burger is just as tasty, but with perfectly cooked bacon and melted white Cheddar cheese. The three specialty burgers at Milagros are the “Frizzled BBQ” (melted white Cheddar cheese, BBQ sauce and frizzled onions), “El Diablo” (spicy, with melted jalapeño jack cheese, roasted Anaheim chile, and a drizzle of spicy chipotle puree), and “Da Kine” (melted American and Cheddar cheese, fresh jalapeños, and a big dollop of Milagros famous guacamole). Frequented by locals and visitors, this spot is always a great restaurant choice one that you may find yourself going back to for years to come. 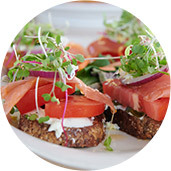 Milagros is also one of our top picks for the Best Places for Drinks on Maui and the Best Places for Lunch on Maui! 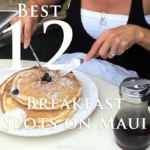 Although we’d like to talk about Maui’s best burger spots all day long, we can’t possibly highlight all of them! More incredibly delicious places on Maui for burgers include: Relish Burger Bistro (Ka’anapali), Charley’s Restaurant & Saloon (Paia), Fleetwood’s (Lahaina), Peggy Sue’s Diner (Kihei), Hula Grill (Ka’anapali), Gazebo (Napili), Pailolo Bar & Grill (Ka’anapali), Ruby’s Diner (Kahului), Kihei Caffe (Kihei), and Rita’s Beach Bar & Grill (Kihei).